From Room it Up, many fabulous styles of the junior sized backpack. Made of 100% polyester, they wear as well as they look. 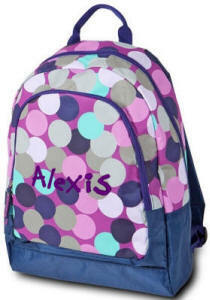 Each Junior Backpack from Room it Up has a padded back, and padded shoulder straps for ultimate comfort. There is also a webbed carry handle if you want to carry the backpack sometimes. The backpack front pocket has a zippered opening. Inside this junior backpack there is storage for pens, a pocket for storing small items, and an ID sleeve. Inside the junior backpack, there is an additional small pocket, and a padded bottom. Fabric straps are from the same designer fabric as the backpack. We personalize on the front pocket, with either a name, initials, or a monogram to create the perfect personalized backpack for back to school. Some styles (the styles with the plain panel at the top) have webbed pockets on the outside and a webbed loop tab to hang a lunch box, or other attachments. Dimensions: 12 in. w x 6 in. d x 16 in. high. Confetti Dot is all about the colors. Such a cute junior sized version of our popular girls backpack. 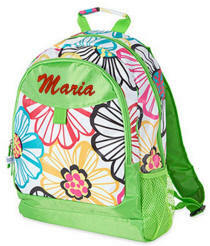 She'll be thrilled with the colors, the design and the padded shoulder straps. Mom will like the webbed carry handle.